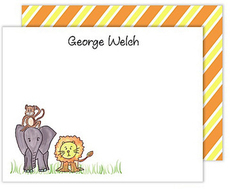 With the look of a hand-painted design, these vividly colored fill-in flat note cards are sure to please. Size 5.5" x 4.25". Set of notes includes blank white envelopes. Address label designed to matching available, see related items. Positioning only as shown.